Fleet Purchasing, Maintenance and Reliability. 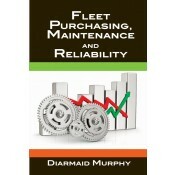 Fleet Purchasing and Maintenance is a concise, easy to understand guide on vehicle purchasing and fleet maintenance for the benefit of business and maintenance managers at all levels, plus students and academics. Not a textbook full of formulas but a guide containing both detail and insights for the practicing fleet and financial manager. The book first covers all aspects of the vehicle and fleet purchasing process from the perspective of the purchaser. It then discusses, in detail, the process of how to approach a fleet purchase once the decision is made. The book then leads into the operations of the fleets, their maintenance systems, efficiencies, inefficiencies, their overall evaluation, and finally, a discussion of maintenance backlog. An easy to understand guide for fleet and financial managers at all levels. Provides unique insights based on the author’s practical experiences in vehicle purchasing. Simple and easy to understand illustrations and diagrams are used throughout. Reviews the basic processes involved in vehicle purchasing and aspects of maintenance systems, including reliability, efficiency, and evaluation. Diarmaid Murphy is an Army Officer in the Irish Defence Forces. Born in Dublin, he grew up in Kildare. Mr. Murphy originally joined the Irish Air Corps, training at Baldonnel Aerodrome. He was then accepted into Army officer training at the Military College and gained a Presidential Commission in the Irish Defence Forces, and a Diploma in International Military Studies. Having studied Transport Operations and Technology at the Dublin Institute of Technology (DIT), he gained an honours degree with distinction and received the Wincanton Award upon conclusion of the course. The Army then assigned him as Officer in Charge of armoured maintenance in his Brigade. In this role, he managed workshops for the Irish Defense Forces, overseeing maintenance for his Brigade and much of the Irish Defense Forces vehicle fleet. In his active career in military transport and engineering, he has served as technical officer on purchasing boards; managed vehicle retrofit and modification programs; and supervised a wide variety of technical projects in telematics, post-accident analysis, fuel contamination and others. With considerable expertise in keeping a fleet of high performance vehicles on the road, Mr. Murphy has participated in projects and conferences with other nations operating a variety of military vehicles. He was also project manager on the restoration project for the Sliabh na mBan armoured Rolls Royce vehicle.